Walk to Downtown and the Old Mill! Just steps away from the river. Pet friendly rental 30 day stays and longer. 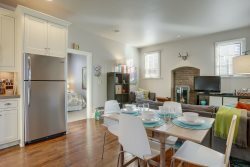 The River Otter is a darling 1 bedroom bungalow available for 30 day stays and longer, steps away from the Deschutes River in walking distance to the Old Mill District, historic downtown, Les Schwab Amphitheater, numerous breweries, the Bend Ale Trail, shops, restaurants, and so much more! Directly behind the house is Bend's newest park, Miller's Landing: a riparian strip of riverfront with osprey nesting, walking trails, and excellent river access. A short meander through this park takes you directly to the Old Mill Shopping District and the Les Schwab Amphitheater. Only a few steps away is a charming footbridge that takes you over the river on an easy walk to Columbia Park and "Pirate Playground", a wonderland for kids. There is also River "put in" access just steps from the bungalow. The River Otter features lots of windows, a fully equipped updated kitchen, and artistic touches that highlight the authentic Bend lifestyle. Relax on the deck or under the aspens in the quaint backyard, and cook out on the gas grill under the stars! If you prefer to get out and explore, there are plenty of hiking and mountain bike trails just minutes from town in the Deschutes National Forest. The spectacular Cascade Mountains and many lakes are an easy 20 minute drive providing endless opportunities for outdoor adventures. This home proudly features European style bedding with fresh, clean duvet covers and high thread count linens, a fully equipped kitchen with dishwasher and microwave, washer, dryer, DVD player, wireless internet, games and much more for you to discover! • 30 day stays and longer. Month to month. • Day bed (twin) great for kids! This is a great little place-- and the situation is unbelievable-- walking distance to everything-- mountain biking, running, kayaking, eating, breweries!! ...and more. A fully refundable $500 security deposit is required to secure your reservation. This will be returned to you after your stay if all is left in accordance with our agreement. Your final balance will be charged to your card on file 30 days before your arrival date. Master Card, Visa, Discover Cards, personal checks and electronic checks are accepted forms of payment. Once your final balance has been processed, you will be sent the address of the home and a lock box combination so you may let yourselves in to enjoy! Check in is 3:00 pm. Check out is 11:00 am. Cancellations made 30 days or more before the arrival date result in a $100 cancelation fee. For cancellations made 30 days or less before the arrival date, please refer to the Terms and Conditions agreement. We hope you enjoy your Bend vacation!